Pontoon Boats are perfect for recreation activities such as barbecues, parties and even just sitting back with friends whilst having a couple drinks. Though, all of this requires a solid pontoon boat decking. None of this is possible if you have a weak deck. This makes it important that we choose our pontoon boat decking materials wisely. Most of pontoon boats are manufactured with an aluminium frame. On top of this frame is the ‘deck’. This is basically the base of the boat. It will hold keep all the segments of the boat together. This article will cover a wide range of different information about pontoon boat decking. Firstly, I’ll be explaining what decking is and why it’s needed. Then I’ll be explaining how big your boats deck should be. I’ll be providing you with some material choices for your boat with the benefits and drawbacks of each one. Finally, I’ll also be providing you with some materials for covering your pontoon boat deck with their benefits and drawbacks. What is the purpose of decking? How big should my deck be? What Is Pontoon Boat Decking and What’s Its Purpose? As mentioned in the introduction, the deck of a boat provides structure for the boat and supports all of it’s segments and pieces. This is essentially the foundation for all the components of the boat. For example, this is where all seating and railings are installed to. Though I’ve already explained what a deck is, you may also benefit from an authoritative definition. The Wikipedia definition of a deck is a permanent covering over a compartment or a hull of a ship. This essentially confirms my own definition, however there is one thing which is different about a pontoon boats deck. As well as the hull of the boat, the deck will also canvas the logs of the boat. Because the deck of your pontoon will provide your boat with it’s structure, it’s important it is strong and durable. Your boat is likely to be put under pressure by harsh winds and waves. Your decking will have to be tough to defend your boat against such harsh conditions. A solid deck makes for a solid boat. This makes it important that you understand what decking is, and what it’s purpose is. As well as this, you should know how to properly maintain it to keep it in good condition; otherwise it will not do its job effectively. You should also know how to repair or replace your deck if it was to become damaged. It’s always great to have such knowledge as you wont always have a professional on-board. I mentioned previously that the unique thing about pontoon boat decking is that the decking covers the logs as well as the hull of the boat. Pontoon boats will have what’s known as pontoon logs, these are essential to the design of the boat. They provide support for the deck and increase the buoyancy of the boat. Without these ‘logs’, the boat wouldn’t be suitable for the water. Pontoon logs are not wooden logs, they’re in fact made from aluminium. The material is somewhat soft and durable. Most importantly it is corrosion resistant, so water will not ruin it. It is also lightweight so that the speed of the boat is not sacrificed and doesn’t add much extra weight. 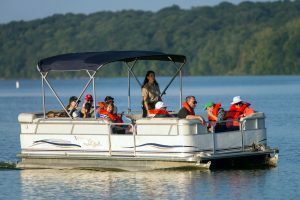 There are many different types of pontoon boat designs, as well as pontoon logs. For example, you can get foam filled logs which are known for providing a reliable floatation system. Foam filled logs are also inexpensive for manufacturers and can save them money in production. I won’t go into too much detail on this topic however it’s evident that better designed pontoon logs are being created every year. This results in better decking and a better boat overall. Pontoon logs and floats can be purchased online of you plan to build your own toon or you need to buy replacements. They also come in a variety of different sizes. You can find them in in sizes from 18 Ft long too 26 Ft long. Keep in mind, they often come in pairs though you will also be able to purchase singular logs. How Is the Decking Attached? There are two main ways in which the deck is attached to the pontoon boat logs. Decking is attached to logs by either being bolted on or screwed on. Both are just as popular as each other however they both have the pros and cons. The use of screws can be a great way if attaching decking to the pontoon logs. This creates a strong bond between the two materials. The screws are in rooted into self-supported holes. This means that no pre-drilling is required. Also, adhesive strips are also used along when screwing. This is great as it will seal any gaps which will defend against leaks. This is another good method of installing decking to pontoon logs. Though, it my least favourite method of the two. This is because when bolting, you will have to pre-drill holes for the bolts. And not only is this extra work but the holes will have to be slightly bigger than the bolts for them to fit in. Because there’s a little room, the bolt will become loose over-time which will allow for leaks. This means that bolting should be inspected every now and then to ensure that there are no defects. You should do your research before doing any handy manning on your own. We must bear in mind that your boat is likely to sustain a beating whilst out on the water. This makes it important that we reinforce it as sturdily as possible. A boat that is built poorly will be weak and won’t last. What Size Pontoon Boat Deck Do I Need? The size of your deck will depend on the purpose of your pontoon boat. Different activities will require different deck sizes. This means that the size of your deck will vary depending on what you plan to use your boat for. Also, you should keep in mind that your decking will always have to be longer than the length of the pontoon logs. This is essential for the stability of your boat. This means that if your logs are 20 ft long then your deck will have to be at least 20 ft long. This is a popular decking size for those who want to use their boat for speed. This is a good size for water sports and towing. This will often accommodate for up to eight people. Best performs in calm waters. This is a good length which will accommodate for up to 12 passengers. I’d recommend this length of decking for boats with the purpose of fishing and general boating. There is enough room for family, friends, and other equipment/storage you want to bring along. Anything over 22 ft long is rather roomy. You’ll be able to fit over 12 passengers on board. Having a decking this long is recommended if you intend on hosting small parties or having family and friend get-togethers. There are many different materials which can be used for pontoon boat decking however I’ll be explaining and analysing a few of the most common pontoon boat decking materials. Chemicals can be used to treat plywood and make the material water resistant. This will prevent the plywood from rotting and decaying. This is a very high-quality material which is very popular for the reasons stated previously. 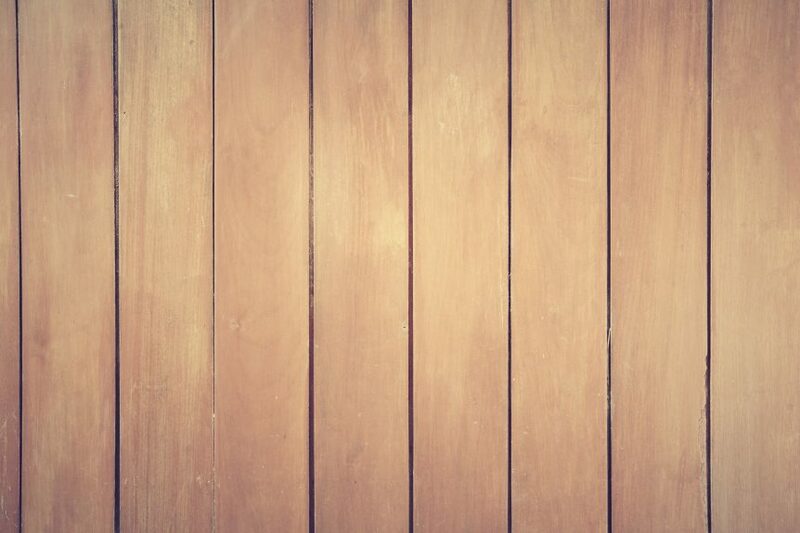 There are many different types of marine-grade plywood. A common misconception with this material is that it’s waterproof. You’d think this due to its name however this is not the case. The plywood itself has not been treated and therefore is not water or rot resistant. The truth is, it’s just built with waterproof glue. Despite this, it’s still a very strong and high-quality material to use. Composite board is a very popular material which consists of wood and plastic. Though, there are various other blends available. Composite board are installed using the same tools as a traditional wooden deck however they also have hidden fasteners. This is a great system which allows for a smooth surface, without any visible screws. Composite board is readily available online, you can find some here. Vinyl boards are another good choice for decking. It is becoming a more commonly used deck material every year. Installing vinyl boards is not easy and will require an experienced professional to complete the job properly. Despite this, I’d highly recommend you look into vinyl for your pontoons deck. Aluminium decking installation is straight-forward and similar to the installation of composite or traditional timber decking. I love this material as it requires little to no maintenance. Simply wiping down the surface with some soap and water is all it takes. There is no inconvenience of having to paint, oiling or staining. We’ve now discussed the best decking materials, so now it’s time to discuss some of the covering options for your decking. Covering is useful in protecting your boats decking materials. Think of it as another layer of protection. This way, if an incident was to occur in which your decking would be damaged, instead the covering will take the brunt of the damage. Therefore, I’ll always recommend investing into some covering. In this section I’ll be providing you with some benefits and drawbacks of some of the best deck covering options. Artificial grass turf can act as a great covering for your pontoons deck. Though to some it may look bizarre having a garden on your boat, for others it will be the perfect material. This is a highly subjective material, which you’ll either love or hate. I’d highly recommend using this material if you have pets and kids on board. The prices of a turf rug will vary depending on the size you need it in however it’s generally inexpensive. You can find some here. This carpet is appropriate for use inside and outside, which makes it a great covering option for your decking material. I really like it for the protection it offers, as well as the appeal it can add to the boat. There are many different styles, designs, and sizes available, you should be able to find the perfect carpet for your tastes. I’d highly recommend this indoor/outdoor carpet with rubber marine backing. This will do the job perfectly, and this product is available in a wide range of different sizes. Another great material for covering your decking are these interlocking tiles. These are a very high-quality alternative which will provide amazing value for money. You can find many customer reviews on its amazon sales page. There are many benefits to this material, and few drawbacks at all. I couldn’t find any drawbacks of this material. Not all decking materials will require that you install covering. As I had mentioned previously, aluminium works just great on its own – there’s no need for a covering. This also applies for materials such as vinyl. Despite this, there are many materials which will require covering. I think the use of covering is great if you have a wooden deck. Some people prefer to play it safe and install covering regardless of their deck material. There’s nothing wrong with that and might even be a good decision if you have the funds for the materials.